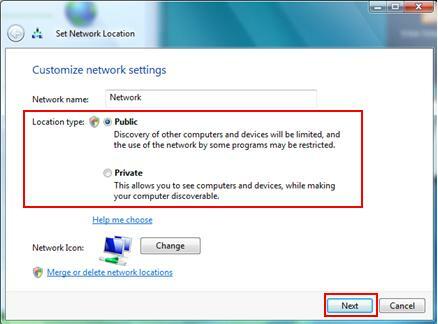 What is Network Location Type of Windows Vista? This is the Windows Vista classified network that will enable certain network and security features based on types of network you choose. Public - The computer is connected to a network that has a direct connection to the Internet, such as public network in airport, coffee shop, library and other public areas. Network discovery, file sharing and other network sharing features will be Off if you choose this option, so that you don’t have the risk of exposing the sensitive information from shared folder accidentally. The Windows firewall will play the role to block all the access from other computers unless you allow program exception. Of course I would assume the Windows firewall is enabled. Private – This is the setting that your computer is connected to trusted computers in home network or office network. Network discovery and file sharing are On by default (also enabled on Windows firewall by default) if you select this setting, so it’s easier for you to discover other computers and do file sharing. Domain – Your computer is part of domain network that contains Active Directory domain controller. 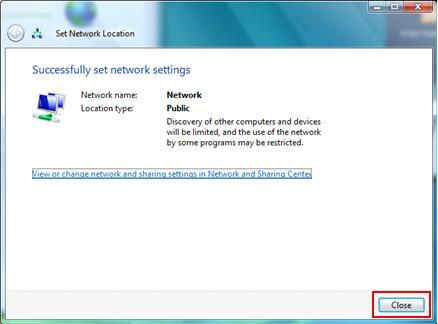 You won’t be able to change the network location type because it’s controlled by your network administrator. 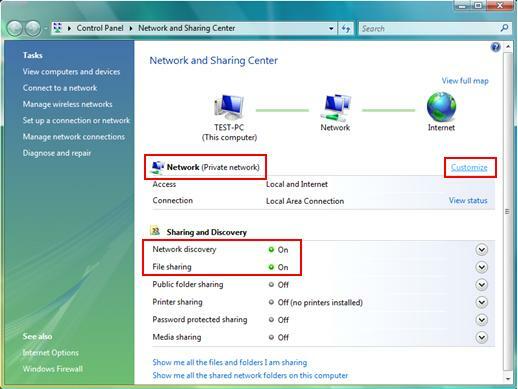 2) Network and Sharing Center window will appear, from here you can see that the network type is Private Network (network discovery and file sharing are On by default). Click Customize to change the network type. 3) Set Network Location window will appear, select Private or Public type, then click Next to finish the change. In this case, I choose Public. 4) Bingo! You have finished the change. Click Close button to close the window. Return to top of "Changing the Network Location Type in Windows Vista"! !